Date: December 26, 2003 Time: approx: 11:30 p.m. The witness did state that she was not going to call this a UFO, meaning something from another world because she really did not firmly believe in this. The lady went on to say that what she and her family have been observing was something they could not explain. Be it military or something else, whatever these objects are, they do some very bizarre things in the sky. 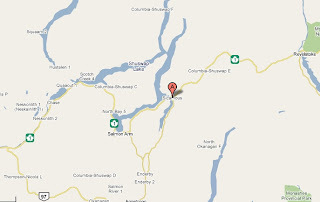 Sicamous, British Columbia Date: December 26, 2003 Time: approx: 11:30 p.m. Sightings continue in this area. I was wrapping up my year end reports for 2003 when a telephone call came in on December 31, 2003. A lady had gone to the internet in search of a Canadian UFO Investigator so she could file a report on some strange on-going sightings which had been taking place in her area. At one point the objects seen were so frightening to her and the family, that the RCMP was called to the witnesses residence to investigate. The witness did state that she was not going to call this a UFO, meaning something from another world because she really did not firmly believe in this. The lady went on to say that what she and her family have been observing was something they could not explain. Be it military or something else, whatever these objects are, they do some very bizarre things in the sky. On December 26, 2003 the dispatcher for the Sicamous, British Columbia RCMP detachment took a call from an excited woman who requested the RCMP come to her home and look into the unusual sights that had been taking place over a period of time. Whilst making the report she felt that she wasn't being taken seriously ... and that maybe they thought her to be a little crazy.. however when an hour passed and the RCMP officer arrived in her yard it was a different story. As soon as he saw the object he stood and looked in amazement. He had no idea what it was. I was told that the officer left the families home and drove towards the mountain where the object was sitting to get a closer and better look. (Brian Vike's, The Vike Factor Note: So far I have left two messages with the Sicamous RCMP detachment to have the constable call me back using my toll free number and as of yet he has not returned my call. I am not giving up on him, and I will keep trying until I get a hold of him even if it means becoming a pest). "An important part to this case is that excellent video footage has been shot by the family". As the tape is rolling you can hear the children in the background commenting on how quickly the object was moving all over the sky. It appears to be moving rather quickly, zig zagging, etc.. I asked the witness about how she was holding the camera, knowing that any slight movement while video taping can make "something" appear to move. In the footage it shows the object moving erratically around the sky. The other members of her family who stood watching this event unfold saw the very same thing with the naked eye..... something flying all around the sky. The witness said these objects (plural as there are more than one at different times) ..... was also seen by her husband whilst he was up in the mountains which is around their area. He described one of the objects as being as big as a house and covered in lights. At the time, he was waiting for his daughter and her cousin to return with the snowmobile. He watched the object with his naked eye and estimated it to be approximately a mile away from his location. He was so excited and frightened at what he saw whilst he waited... that he immediately drove back home, ran into the house and told his wife of his adventure. She thought he had been drinking as he was acting strange and obviously was very scared. Knowing they had to go back out to that location where the object was seen because they had to pick up the kids, the gentleman said he was not going back out there alone ! The husband's sighting took place before December 26, 2003, and what the family caught on tape on December 26, 2003 was the same object. It had returned. They also saw the object through their binoculars and described it as being in the shape of an acorn or a diamond. It was an extraordinary sighting because not only did the object shine brightly and move around erratically ... but at one point when it was stationary ... it shot out a large red fireball, then six bright orange lights appeared in the sky around it. Each of the orange lights had another two white lights on them. These white lights shot a beam of light towards the ground. Approximately half an hour later four more of the large acorn/diamond shaped objects showed up and sat either stationary or moved around the sky. The witnesses said the objects appeared to have hundreds of lights on each of them. These folks have recently moved into this home, but the previous owners said they used to watch in the daylight hours ... on many occasions silver disk shaped objects flying over and around the mountains behind the house. This case is under investigation and this is only raw data at present. Video tape is currently being examined. A foot note to this. The lady who reported the sighting and who rang the RCMP told me that when the constable arrived and saw the object .. he commented to her that he knew of nothing that moved that quickly ... nor of anything that could stop like it did on a dime. This story proved interesting enough that the television station (CHBC TV out of Kelowna, British Columbia) sent a news crew to interview the family and to get a copy of the footage. CHBC TV is a part of the Global TV network which is one of Canada's giants in the media business. The story ended up airing not just on that station, but aired all over British Columbia on Global BCTV. They ran the story at least three times as a part of their news. Once at 6:00 p.m. Friday night, again at 11:00 p.m. and again on the Saturday morning news. As I was the investigator on the case they also called me a number of times and interviewed me about the story. The news gave this story a good length of time to play out on TV which was really great to see. Something else of interest prior to these sightings but in the same area was when an RCMP officer who was out on his usual rounds in his patrol car ... noticed an object in the sky and was instantly hit with a beam of light from it. After his shift was over and upon his return to his detachment he informed his co-workers of what he had seen. They thought he was seeing things. Now perhaps they have a different interpretation of the event. Brian Vike is requesting if anyone else has been witness to this object at the date and time given above I would certainly like to hear from you. Also if anyone from around the surrounding communities have witnessed a strange object in the month of December 2003 I again would enjoy hearing from you. On a separate note, sightings are still coming in. Reports from Nova Scotia back from the 1970s, Vernon, Kelowna, Kitimat, Terrace, Comox, British Columbia and from Alberta etc.. Plus other reports from aound the world.